The Family Nurse Practitioner (FNP) major prepares the advanced practice nurse to provide primary health care services across the lifespan to individuals, families and aggregates in the community. Besides primary care services, critical foci include practice models which emphasize the family as unit, health promotion and disease prevention and interdisciplinary collaboration. The goal of the FNP program is to prepare highly skilled and culturally sensitive advanced practice nurses who are committed to providing quality and cost effective primary care services to individuals, families and communities. The program places special emphasis on providing services to the medically underserved. The MSON is committed to flexibility in the program and therefore offers both full-time and part-time options for degree completion. The post-BSN to DNP with MSN exit with a major in FNP requires a total of 72 credits. A total of 47 credit hours and 720 clinical hours must be completed for the MSN exit where the Master of Science in Nursing is conferred. An additional 25 credits and additional clinical hours are required for the completion of the DNP. Graduates of the program are eligible to sit for the national certification examination administered by the American Nurses Credentialing Center (ANCC) or the American Academy of Nurse Practitioners (AANPCP). Students are urged to contact the specific board of nursing in the state in which they intend to practice in order to ensure they are in full compliance with the education, practice and certification requirements. 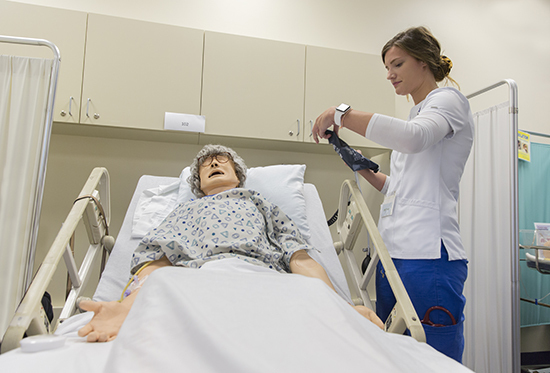 The MSN degree with the FNP major requires 47 credit hours and 720 clinical hours. The MSON is committed to flexibility in the program and therefore offers both full- and part-time options for degree completion. Full-time study can be completed in two years with some courses offered during the summer semester. A program of part-time study can be completed in three years. The Post-Master’s Family Nurse Practitioner Graduate Certificate option is available to applicants that have already earned a master of science in Nursing degree with a major in Nursing from an accredited program. This certificate program does not lead to an academic degree from the University of Detroit Mercy. The graduate Family Nurse Practitioner Post-Master's Certificate Program requires 29 credit hours of coursework and 720 clinical hours (500 clinical hours for certified nurse practitioners in a specialty outside of FNP who are active). An individualized program of study will be designed based on an applicant’s prior academic coursework and professional and clinical experiences. Transcripts from prior academic institutions will be reviewed by the FNP program coordinator/advisor to determine an applicant’s specific program of study and a gap analysis will be completed. The FNP program does not accept any clinical courses (theory or didactic) or advanced health assessment as transfer courses. If courses in professional role, pathophysiology and pharmacology have been completed prior to admission to the certificate program and are equivalent to the course content in approved MSON courses, they may be transferred to the program. Full-time and part-time options are available for program completion. Graduates of the FNP Post-Master's Certificate program are eligible to sit for the Family Nurse Practitioner certification exam offered by the American Nurses Credentialing Center (ANCC) or American Academy of Nurse Practitioners Certification Program (AANPCP).